Yijun “Jane” Liu and Hui “Angela” Wang knew they were in for an adventure when they accepted a 2017 offer to become USC Chan’s China Initiative Scholars. 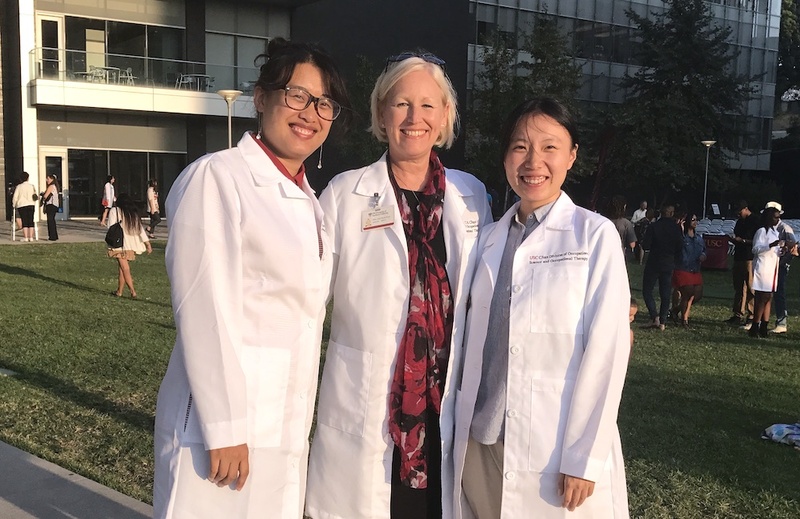 As such, Yijun and Hui will earn both master’s and clinical doctorate degrees at USC before accepting positions in Beijing as the first occupational therapy faculty members at Peking University Health Science Center. They are now more than halfway through the program and have experienced an array of triumphs and challenges. Yijun and Hui’s earliest memories of arriving to California are sunny. While moving to a new country wasn’t easy, it was made smoother thanks to the advice of fellow Trojans. “Some OTD residents who were also from China showed us some secrets of living in L.A.,” Hui says. Learning the ins and out of public transportation, performing instrumental activities of daily living in a new city and learning what to expect from school took some time. Then there is the issue of homesickness. Those goals entailed by USC Chan’s China Initiative are ambitious, but the pair are worthy to take them on. By training, Hui is a physical therapist and Yijun is a physician. Since OT is not regularly distinguished as a unique and valuable profession in China, the pair feel that their multidisciplinary backgrounds position them well to become effective educators in the future. “In fact, we can use the power of meaningful occupation and principle of adaptation to help us bring OT to China,” Yijun added. While it’s true that OT was born in the United States, the scholars argue that its foundational concepts are globally appreciated. Their advice to future China Initiative Scholars is to have faith that USC Chan’s curriculum is designed to smoothly transition students from related disciplines into OT. That advice is valuable to all occupational therapy students regardless of their cultural, professional or educational backgrounds.